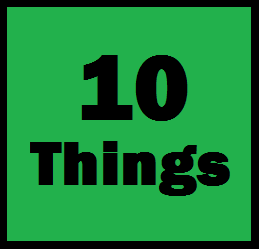 10 Things To Do On Daily Basis - Something New Everyday! When you get caught up in the everyday cycle of waking up, working, eating and sleeping it is often easy to forget about your health and well-being. Here are 10 things that you should be doing every day that will help you organise and be a better person not only for yourself but for those around you. It really is true what they say – life is too short not to tell someone close to you that you love them. Whether thats a family member, friend or your significant other all it takes is a quick message or a phone call and you can make someones day so much better with a simple gesture that takes a matter of minutes. Exercise is important and you should do some form of exercise every day. You don't have to run miles or spend hours at the gym and life and work can easily get in the way. If you set aside at least 20 minutes a day to physically push yourself the change in your health can be huge. Exercise improves emotional state and your ability to focus. Keeping to this routine will also help you develop self discipline which is a great trait to have. The world is a hugely diverse place full on new an interesting things. You can learn new languages, travel and explore new locations, meet new people and push yourself out of your comfort zone. It is all to easy to get stuck in the cycle of everyday life. 4. Organise 5 minutes of quietness and alone time. In that spare 5 minutes you can do as you like. It's your time so spend it wisely. With the mad rush of everyday life we often don't make time for ourselves. Use those 5 minutes to reflect on the positive things in your life. 5. Pay somebody a compliment. Not only can it be a confidence boost for yourself, it will also put a smile on the face of the person you compliment and probably put them in a good mood for the rest of the day. It's easy to be a reclusive for a whole day but it's always nice to have a quick chat with someone else, preferably face to face. It sounds obvious, if you start the day in a positive Mindset things are always going to be better. Not only that, but studies have suggested that remaining optimistic can make you healthier and extend your life. Humour has many benefits, one of those being that people who laugh more can have stronger immune systems and are at less risk of a heart attack or stroke. If you don't find yourself in any laugh-out-loud situations you can always go on YouTube and watch something that makes you laugh or reminisce about moments that have made you laugh in the past. The term "Sleeping on it" actually makes sense. When you are tired it is a lot harder to be happy, and your immune system is weaker. When you aren't tired you can make clearer decisions and have a more positive outlook on life, which is why sleep is so important. If you work in an office, a factory, a warehouse or in any form of building for that matter it's important to get outdoors everyday other than the journey between work and home. A walk through the woods or the local park will be far better than a walk through your local High Street as the smell of fresh air can increase happiness and help relieve stress.